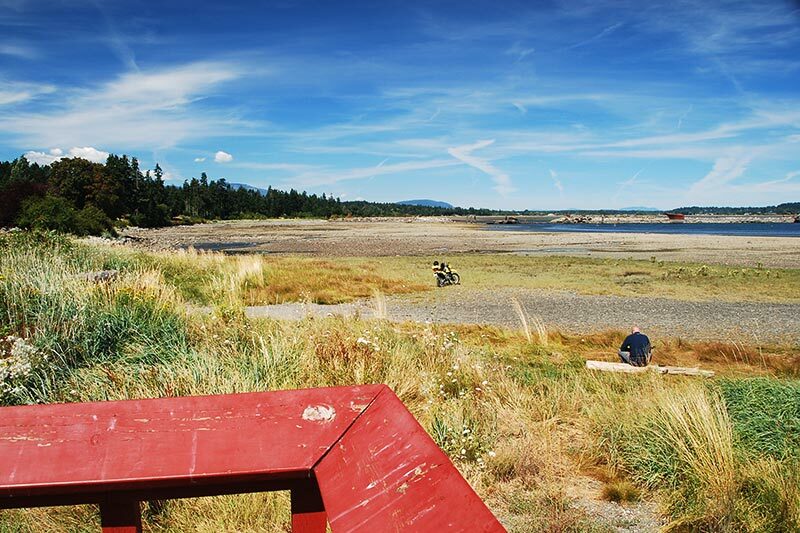 A rural, seaside village directly across the bay from Comox in the Comox Valley. In the early 1900s, Royston was the major port for the Comox Valley logging industry. Logs were shipped here by rail, boomed in the harbour, then towed across to Fraser Mills on the B.C. mainland to be made into lumber. William Roy and his family settled here in 1890, collaborating with a real estate promoter named Frederick Warren to lay out a townsite that they named Royston. The settlement could have been named as “Roy’s Town” but could also have been named after Warren’s home town of Royston in Cambridgeshire – or both. Location: Royston is located south of Comox, in the Comox Valley. 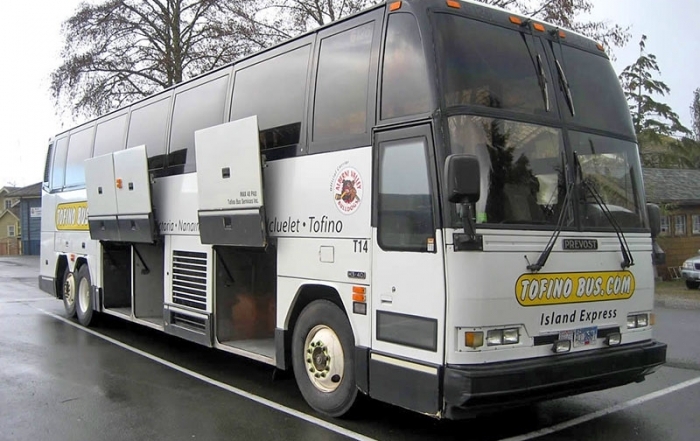 Transportation links to the Comox Valley include rail, bus, car, ferry, and air service, including floatplane access. BC Ferries operates a ferry route between Comox and Powell River on the British Columbia mainland. The Comox Valley Regional Airport is served by three major airlines, with daily flights between Vancouver and Comox and direct flights from Calgary. Breakwater: To protect floating log booms for the Comox Logging and Railway Company, a breakwater was built from the sunken hulks of old Canadian warships and freighters – the hulks can still be seen in the harbour. 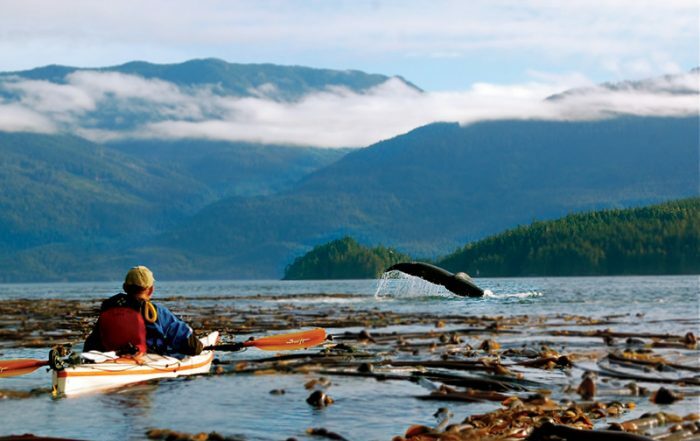 Comox Lake: Surrounded by mountains and fed by a glacier, glorious Comox Lake, has good freshwater fishing for trout and char year-round. Boaters must beware of the strong winds that rise in the afternoon on the large, dammed lake west of Royston on Comox Lake Road. You’ll find a boat launch at the west end of Comox Lake Road. Beaches: The beaches around Royston and Comox are worth a visit, as miles of sandy shore lead off both north and south of the quiet little seaside town. Take the time to drive east of Hwy 19 as it passes through Courtenay, and follow the signs to the BC Ferries terminal in Comox. 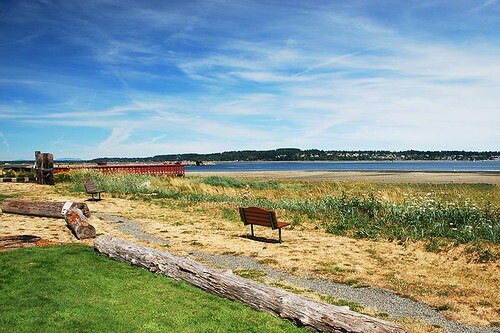 Long, sandy beaches can be found at Goose Spit Regional Park, which noses out into Comox Harbour at the west end of Hawkins Road. Kin Beach Park on Kilmorley Road south of the ferry terminal is a good spot to pass time if you’re waiting for a sailing. 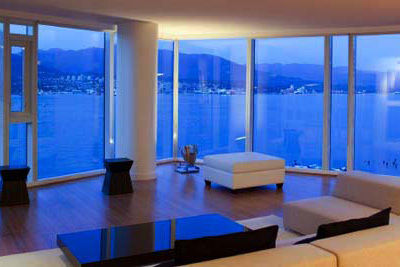 Offshore, Texada Island’s dark form lies in the strait directly east of Comox, while Denman Island lies to the south. 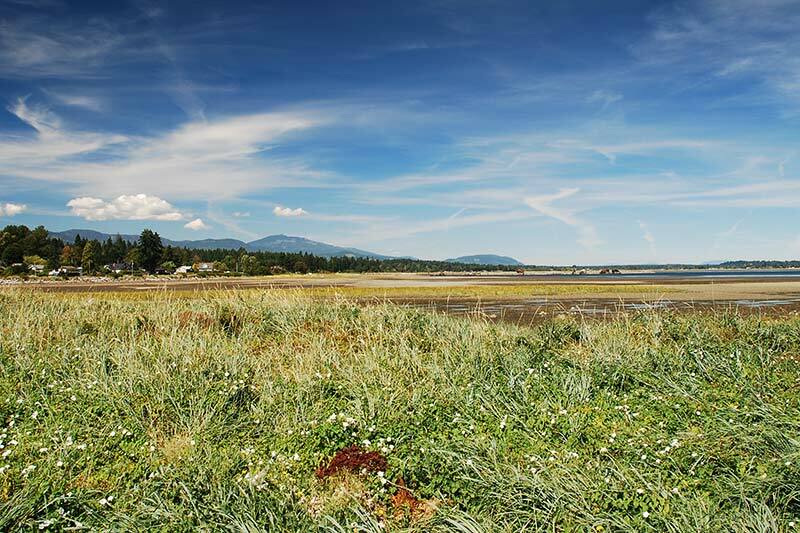 Wildlife Viewing: The Courtenay River empties into Comox Harbour just north of Royston, creating a rich tidal estuary teeming with wildlife. The Courtenay River Estuary is considered to be the single most important wintering site in the world for the protected Trumpeter Swan. Attend February’s weeklong Trumpeter Swan Festival and discover why 2000 Trumpeter Swans spend their winter in the Comox Valley! Trumpeter Swans: The trumpeter swans come in low over the treetops, two or three at a time. With an 8-foot (2.5-m) wingspan, the world’s largest waterfowl exemplifies aerodynamic magnificence. Mimicking the landing gear of a plane, pairs of wide, webbed feet drop down at the last instant to break their fall with a finesse that would make the best bush pilot burn with envy. Seconds after landing, the new arrivals come to a quick halt, fold their wings, arch their necks like bass clefs, and drift regally off to join other swans already on site for the night. An aristocratic bugling call and response rises among them that makes the homely honk of Canada geese and the quotidian quack of mallards sound decidedly plebian. Trumpeter swan viewing sites abound in the valley, including along the well-marked scenic route on Comox Road between Courtenay and Comox, a route that is equally well suited to driving and cycling. Shoreline sites include Point Holmes and Cape Lazo as well as Kin Beach, Singing Sands, and Seal Bay Parks. For more information on trumpeter swans, contact the Comox-Strathcona Natural History Society, 250-338-0380. At Royston, you can turn inland for an excursion to Cumberland, once Canada’s smallest and westernmost city, and a bustling coal mining community from 1888 to 1966. Whether your interest is in history, culture, recreation or beautiful scenery, Cumberland has something for everyone. 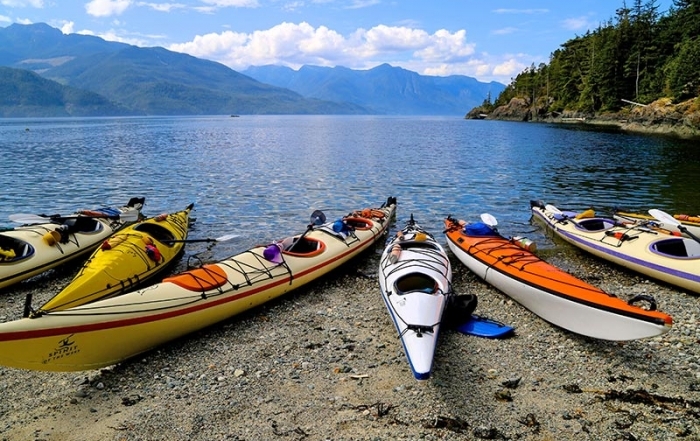 Located off the northwest tip of Denman Island, just offshore from Royston, is Sandy Island Marine Provincial Park. 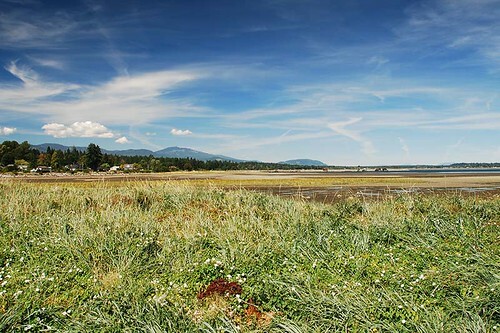 At spring low tide the 33-hectare Sandy Island is connected to Longbeak Point on Denman Island by an exposed sand bank. The marine park is ideal for day trips and overnight camping, and offers 8 rustic campsites set in a wonderful grove of Douglas-fir trees. You will want to spend a day on the lovely Denman Island and Hornby Island, touring artists’ studios, swimming on a sandy beach, hiking the bluffs and trails, scuba diving or just plain relaxing. Catch a ferry from Buckley Bay, south of Royston.